At Williams Refrigeration Australia, we’re constantly on the look-out to improve the user experience for our foodservice design clients. At Williams Refrigeration Australia, we’re constantly on the look-out to improve the user experience for our foodservice design clients. Our field team vigilantly looks out for customer pain-points and industry trends—so we’re taking the increased interest in Building Information Modelling (BIM) seriously. The uptake of 3D design methods is consistently growing. 3D software has proven to deliver cost savings through more resolved design solutions—highlighting potential issues well before fit-out stage. The ability to vary options and better visualise layouts is quickly resulting in 3D replacing traditional 2D layout software. In keeping with this, we’re pleased to announce the development of a full suite of 3D models of our refrigerated units. The models have been built to conform with the FCSI (Foodservice Consultants Society International) Revit Foodservice Equipment Standards. 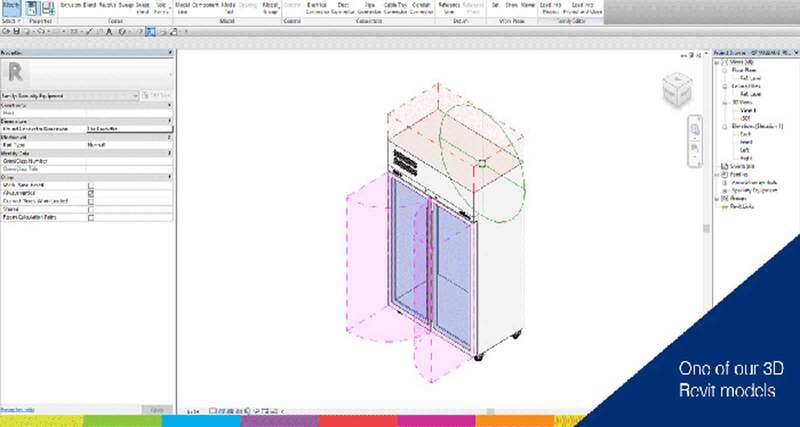 This AutoDesk Revit library will undoubtedly make life easier for those specifying Williams. Mounting type – castor, leg or plinth. Finish – stainless, black or white. Temperature – fridge or freezer. Counter units – under a bench. Doors or drawers. Blown airwells. Models are available for self-contained units as well as remote refrigeration systems. All units detail electrical supply requirements, door swings and refrigerant type. Self-contained units provide heat rejection data and ventilation space requirements. Remote units show connection points and sizes for drainage and refrigeration as well as refrigeration wattage requirements. Williams has developed a full suite of Revit models and are making them available as a USB kit. Register here to receive our 2018 Revit kit.